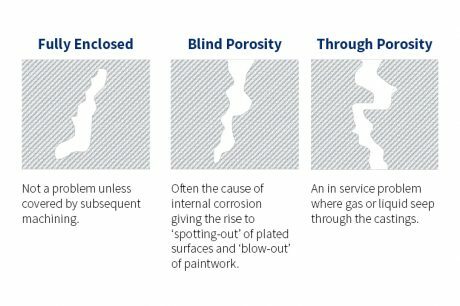 FLOW POROSITY: Resulting in surface or internal defects caused by poor pressure or metal flow conditions in the process. GAS POROSITY: Usually internal, caused by trapped gases of various kinds in the die. Gas porosity comes from three main sources in die-casting: trapped air, steam and burned lubricant. SHRINK POROSITY: The most common and most difficult to control, caused by the change in volume as the metal changes state from liquid to solid.